Family wealth in 21st Century Britain is huge and growing, rising from £9.9 trillion before the financial crisis to over £11 trillion in the most recent data – more than six times our national income. Significant increases have come from house price rises in the 1990s and 2000s, followed by major growth in private pension wealth more recently, as falling interest rates have increased the value of defined benefit entitlements. Wealth is also key for those concerned with questions of intergenerational fairness, given emerging evidence of the asset accumulation challenges faced by younger cohorts, most visibly when it comes to home ownership. 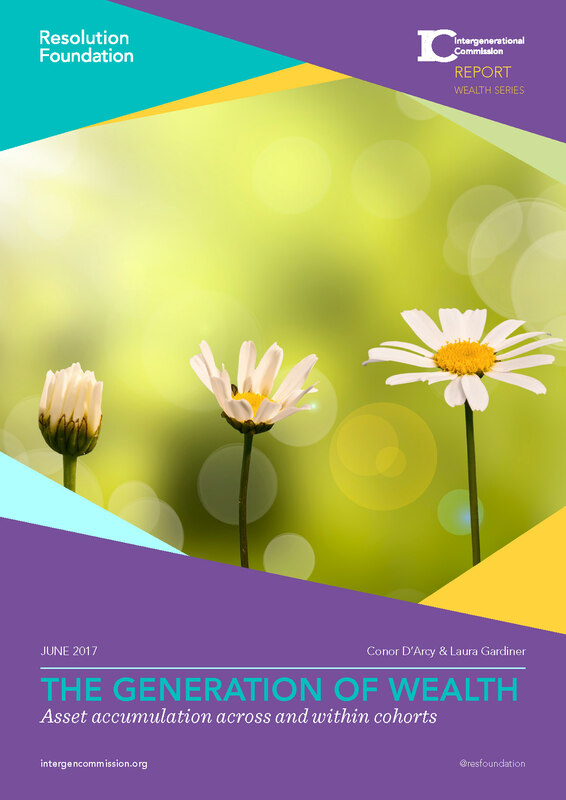 That’s why the analysis in this report – the seventh for the Intergenerational Commission – provides an up-to-date and comprehensive picture of wealth in Britain today; its distribution across society and in particular across and within different birth cohorts; and the combination of active accumulation and wider economic shifts that have got us to this position. Britain’s wealth is significant and has grown over time, with the inequality of this wealth falling in the long term but rising most recently. Wealth inequality is almost twice as high as the inequality of household incomes that is discussed much more frequently, and has been rising since the financial crisis. Generational wealth progress has gone into reverse, with all cohorts born since 1955 falling behind predecessors at the same age. A typical adult in the second-youngest baby boomer cohort born 1956-60 had 7 per cent less wealth at age 55 than the cohort at the same age five years previously. A typical adult born during 1981-85 had half as much total net wealth at age 30 as a typical adult at the same age five years before them. As well as differences across cohorts, wealth gaps within cohorts are large and show signs of increasing. Overall wealth inequality within cohorts looks to have risen slightly for each successive cohort born during the 1960s, 1970s and 1980s, compared to older cohorts at the same age. No such effect is apparent for those born before 1960. Unexpected wealth windfalls – rather than active savings behaviour – explain the majority of families’ wealth accumulation in recent decades. The vast majority (82 per cent) of net property wealth growth since the early 1990s has been driven by the house price boom rather than active savings behaviour, equivalent to a real-terms increase in aggregate net property wealth of £2.3 trillion over the past couple of decades. Significant wealth windfalls from the increasing value of defined benefit pension entitlements due to rising longevity and falling interest rates explain three-quarters of private pension wealth changes between 2006-08 and 2012-14, a windfall totalling £800 billion across families. These wealth windfalls have benefitted cohorts containing the baby boomers in particular. For example, those born in the 1950s benefited from an average real-terms property wealth windfall of £80,000 over the two decades to 2012-14, and an average pension ‘valuation’ windfall of £45,000 in the period during and since the financial crisis. The figures for those born in the 1970s – who are too young to have benefited through the entirety of the house price boom – are £35,000 and £10,000 respectively. The distribution and accumulation of wealth should take greater prominence in economic and policy debates. Even as wealth has risen significantly as a share of national income, the amount of taxation raised from it has fallen or remained flat since the 1980s. This is despite public finance pressures both from the financial crisis and from an ageing population in the coming decades.